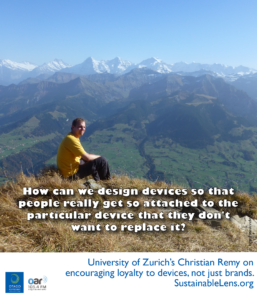 Christian Remy is a researcher at the University of Zurich, He researches attachment theory and considers how we can encourage loyalty to devices, not just brands. Christian: What kind of consumer electronics do people buy and how can we give them information on how to make better-informed purchasing decisions. We had some information back then, we thought we had some information on this later on, which turned out to be not the case, so that project changed, slightly changed gears in my PhD. What I stuck with was studying people’s purchasing behavior, what kind of technology are they buying and why are they buying this? Then there was this entire research area around the replacement cycle; basically, so why do people buy a new mobile phone every year, when actually in theory there is no reason why it shouldn’t work for 5 years? If you look at it objectively, there’s lots of motivation to not buy a new phone, because you got accustomed to it, you have all of your data on it, it’s expensive, and all of this kind of stuff, but still people go on and buy a new iPhone every year, or a new AT&T phone, something, whatever, every year. That got me into this obsolescence thing, obviously. You have this designed obsolescence discussion, which is the sort of paranoid, maybe true assumption that industry is building devices on purpose so that they break after 2 years. There’s this joke usually that a phone has a 2-year guarantee and exactly after 2 years and 1 day, the phone breaks. Sam: The business model is entirely determined on selling more stuff. Sam: They have to sell you that new phone? Sam: Even if it doesn’t break, they heavily advertise the next one so you feel quite embarrassed that you’ve got an old one. Sam: Now you have this sustainable viewpoint, is that the killer app? but is that the killer undoing of computing and sustainability that is so fundamental that we need to sell you a new computer, a new phone? Can we overcome that? Christian: I would argue we can, because the industry itself actually, I see a silver lining within the industry itself, which is the move from selling devices, selling hardware, to selling services, which you see in all of this cloud computing that is coming up. Everything is moving into the cloud. You don’t buy a piece of software anymore, but you buy a subscription for a piece of software, and you have all of those different income strategies. Maybe those at some point can, for industry, make up for the effect of reduced revenue from selling new devices. I don’t know. Like I said, it’s a silver lining. It’s a little bit of wishful thinking, maybe, on my part, but maybe that’s the case. I very recently, just before I came to this conference, read an article that actually there are signs for this rapid replacement cycle slowing down. I don’t remember the exact figures, but I think there were studies that in the U.S. people were replacing their phones every 14 months, on average, and I think that is slightly going down. It’s probably down to something like 17 months, and obviously at some point every market is saturated as well. I think in 2014 we were producing or selling 1 billion phones a year, and at some point everyone has a phone. Sam: Have they perhaps reached a zenith of the stuff that they can pack into a phone that’s useful? There’s not many more things, perhaps, that they can put into it that’s going to make such a big difference to me? Christian: You would think so. Obviously, every phone has a camera right now. Many phones have some kind of super-high precision detection thing, which can even do fingerprint detection and stuff like that. If the new phone doesn’t have any new features, besides just being 5% faster, then at some point people might also just be reluctant to buy a new phone, because they don’t really see the point. Yeah, that could be the case. Obviously, as history has shown us, Moore’s Law and all those kinds of things that predict that technological advancement will always go on and go on, and go on, and there will always be new things, so maybe in 10 years from now there will be a new thing that needs to be in everyone’s phone, which proves us wrong. Sam: Yeah, I’m just trying to think about what else are we carrying. You see those pictures of what the phone has replaced, the desk and the typewriter, and the camera, and everything else, but not carrying that much else. I bet there’ll be something else, won’t there? Christian: If you told someone in the ’80s that every phone once would have a camera, they would be like, “Why? I don’t have a camera with me? I don’t think … ” I don’t know, ask 100 people in the ’80s on the streets if they have a camera with them. I don’t think there would be that many people, so the camera became an essential part of the phone now, even though it hasn’t really been something that everyone has been carrying with them. I think it would have to go beyond just what people have on them, but what artefacts of technology are you using in your everyday life? It is an interesting discussion. It’s sort of dangerous, because we’re doing the job for industry to find the new thing to carry on obsolescence, almost. Sam: Yes, but now we’re at the point where we can argue that it’s not going to carry on. Is it a problem that we can say actually that that problem is going to fade away? You’d have to be brave to say that, wouldn’t you? Sam: That’s what you started with when you went to Zurich. Then where did you go? Christian: Yeah, like I said, obsolescence was the kind of issue. Then one of the things that I found out, that there are so many motivators for people to buy new phones, but what are the motivators for people to actually keep their phones? Then I looked at research, and there is actually so much in the research domain that already tells us strategies on how to design devices in a way that people don’t throw them away as easily. There’s lots of stuff about augmentation, so, for example, how can you reuse technology later on? We have met some people here at the conference, actually, who took their old tablet just as an e-book reader, even though it wasn’t 100% functional anymore. You can, obviously, resell devices like a second-hand market, and then my kind of direction of the research is rather something about ensoulment, or emotional design, as Don Norman called, or attachment framework, which is exactly what I’m focusing on. How can we design devices so that people really get so attached to the particular device that they don’t want to replace it? That’s what I was focusing on. Sam: Okay, so emotional design or attachment design 101, go. Christian: 101, well, it has some criteria on how to achieve this, so one of those is, for example, engagement. If you have a device that, when you use it, it creates some sort of … You’re engaged in using it. The way how you interact with the device really is fun and enjoyable; that’s something. Memories is a strong facilitator for attachment. When you look at your device and you remember, “Oh, I’ve used that at this conference. I’ve used that on my vacation, and I really don’t want to get rid of that,” because those memories are connected to the device. Sam: Isn’t my attachment to the stuff that’s in the device, not the device? The photos that I’ve collected migrate quite happily around my progression of, my series of devices. Sam: I was about to say that what’s working for me is that my phone, I’m just holding it up in front of me here, looking at it, my phone is attached to my wallet and for me that’s the thing that’s made such a huge difference. I used to lose all the time, misplace all the time, both my wallet and my phone. Having the 2 things joined together means that it’s working for me, and I really, really like this solution. I’ve seen others, and there’s other things that work as well. For me, this 100% works. Christian: What are you actually attached to? Are you attached to the wallet, or to the phone? It looks to me like you could easily just replace the phone and buy a new one, as long as it fits the form factor of this particular wallet. Sam: I’m attached to this combo. Sam: Just thinking about it, I said it’s perfect, but it’s not quite perfect. You see here … Sorry people on the radio, see here that I’ve drawn lines here, and those lines are to remind me, when I put my cards in, I have to put the strip in on that side, because I went through 2 or 3 cycles of breaking cards by putting them in on that side and having the magnets that hold it close, breaking the magnetic strip. Christian: Oh, there’s a magnet in there? Sam: … but, once I fixed that, and maybe that’s one of those things about the attachment is that I’m able to modify it to suit me. Christian: That is a perfect example of attachment through customization, because you personalized this. This is not only like some kind of wallet you’ve found worked really well for you, but you actually modified this to suit your needs. You made some modifications to it and even if I had exactly the same one, it wouldn’t have those personalized marks there, or maybe if I make the discovery and I would put them on there. This is like not just finding this particular brand of wallet and that particular design, but actually just this one is very individual, like you wouldn’t find a second one. Sam: Actually, annoying, as you said this particular brand. It’s not branded and that has meant that I can’t find a replacement. Sam: I can’t go into a shop and say, “I want the something, something one,” because it doesn’t appear to exist. I can’t find it again. Christian: Which is obviously very difficult for consumer electronics, because they’re very much on brand. Christian: That reminds me of another criterion, which is learned functionality, which usually refers more to technological things, but that’s kind of like you learned the particular way on how to use the technology in accommodation with this wallet, which is something that you probably have a certain value assigned to this, like, “I know how to use this.” Like you said, it doesn’t really bother you, so it’s fine, but it you were to buy a new wallet or a new phone that would all of a sudden have a camera positioned slightly elsewhere, and then you have to learn a new behaviour, or learn a new functionality. That would be off-putting, and maybe it’s another reason to be already attached this particular wallet and this phone. Sam: Another thing about it is that it didn’t actually suit me at the start, and I had to change my behavior in a significant way because of it, and that is because it doesn’t have a place for coins. It quickly prompted me to avoid coins like the plaque, because I’d end up putting them in other places, in pockets and things, and then I’d spend them to get rid of them, because I don’t want to carry coins. I like this. It works for me, except that I had to quite quickly wean myself off coins. Christian: Well, maybe not too bad, as long as it works. Sam: Maybe I’m talking myself out of this, but it bizarrely works for me. You mentioned the form factor before, so this is a form factor for an iPhone 5. Not that I’ve needed an iPhone 6, but if I get an iPhone 6, I also have to replace this. Sam: I imagine if somebody was to give me an iPhone 6, I might solve that problem, but I’m certainly not in a rush because of it. Christian: Yeah, so that’s a good point. Actually, I don’t remember one of the designers that we did the study with, actually had an idea to that; maybe. Off the top of my head I don’t recall it, but it would certainly be something that we would go back to have … What am I looking for? The kind of peripherals that you have, like the casings, like in the ’90s we had casings for phones and stuff like that you could switch off the keyboards and stuff like that. Now every phone has a bumper, I think they call them bumpers for the iPhone, so maybe those kind of things can also be used in combination to create this kind of attachment. Yeah, could be. Could be potential. Sam: The companies don’t help the situation by changing, primarily for technical reasons, but, for example, when they changed the big plug on the iPhone and the iPad to a little one, to the Lightning connector, the microphone that we’re currently talking through has got an adapter and for some reason they still haven’t provided a Lightning Adapter for that device. I have sellotaped to the output from the microphone the adapter to go into the Lightning, so I’m kind of like, “This microphone works for me. It’s much, much better than the microphone on the iPad itself. Sam: Where did that lead you, that work? Christian: Where did it lead me? Now, as I’m finishing my work, as in writing up, it’s kind of a double-edged sword. It’s very interesting because, obviously, it’s both very interesting and very well-received, like even at previous conferences I’ve met people from industry, who actually said this was very interesting, but at the same time it’s also very challenging. I always come across those arguments. It’s kind of like this dilemma that, yes, attachment is great and probably people want to be attached to their personal belongings, especially something as expensive as a phone, but also the industry and economy works against that. That’s the dilemma I’m facing, but in my future work I would say, in my outlook, I’ve taken this prerogative stance that maybe this is all changing in the future, hopefully, I’d say, as I said before, with more and more upcoming services structure that we’re moving more into companies providing services rather than just hardware. Sam: Those deals that you can get, certainly in New Zealand and I’ve seen them in the U.K., so presumably they’re wider, where instead of buying a phone you buy the phone service with the company, the advantage of doing that is that they promise continual upgrades. The other way that they have moved to that phone as a service is by doing what we would think is the wrong thing. Christian: By giving you an entirely new phone every year, you say? Christian: Yeah, right, so obviously that’s not what I’m thinking of. What I’m thinking of is more like the entire area of modular phones, which has been proposed, I think, first time 10 years ago. More recently, we’ve seen them coming up more and more, and also being more successful. The Fairphone is just one of them, it’s like the very popular one, but there’s Phonebloks, there’s Project Ara, there’s a couple of phones that are coming out and offering those modular things. I guess we were looking at this, and rather than just giving you an entirely new phone, they would give you the option to … “You have this subscription-based thing. If a new phone comes out, we promise you we’ll just give you the high-resolution screen and you can switch it.” Obviously, the best way would be if you could switch it yourself, because what else would give you more satisfaction than if you could replace something in your phone yourself, rather than just send it somewhere and you get a new phone back, or you get a new part of the phone back? I think, again, that’s something where we don’t know what the future holds. I certainly hope that it goes into this direction, that’s it’s into the modular phones instead of just replacing entire devices. Sam: Is this the work that you’re extracting these sorts of themes and calling them as patterns? Christian: Yeah. I think there is a lot of patterns in there, because as you have said, moving entirely into services, have modular phones, have re-user phones, so you give it someone else after you personally are not using it anymore, for whatever reason, maybe augmenting a device by using it for something beyond its intended purpose. After some of the functionality breaks, maybe you can use the tablet as a picture frame on your cupboard. There are a variety of patterns in there that I see emerging, that could be potentially very useful for us in the future. Sam: You initially started out stumbling into computer programming by solving your math problems with computer programming. Are we going to be able to solve sustainability problems with computer programming? Christian: Good question, difficult question. I don’t think that’s a yes or no answer here. I often like to say we are part of the problem, and that’s why I think we have an obligation to be part of the solution. If you look at this conference here, there are 3700 people, I think, around here, and they’re all striving for innovation. They are all, not all of them, but many of them are striving to find the new technological development that brings HCI, human-computer interaction, as a field forward, that brings computer science forward. New technology is being developed and this obviously contributes to obsolescence, because, as we’ve talked about before, 20, 30 years ago no one would have thought of a camera being on a mobile phone. Maybe in 20 years from now we have something in our pockets that doesn’t look at all like the mobile phone, but it’s something that is super-obvious and we all need then. Maybe that’s something that is appearing here, now, in computing research. That’s why I think we are part of the problem. This obsolescence is brought upon the society by our computing community, and that’s why I think we need to try to address this issue. Sam: I’ve thought of an app that we don’t have yet, and that’s if we could take a pill and be filled up with some nanobots. It would be continually monitoring our health from the inside and our phone would be connected to medical specialists and it looked after us. That’s a compelling reason for buying a new phone. I’m sorry, even if I like the device, that would be a thing that would say, “Sorry, old device, you’re gone,” so, are we kidding ourselves? Oh, my God, I don’t even want to think about that, but maybe it is something like that. I don’t know if I want to upgrade something that’s embedded in my skin every year, even if I have it. Christian: Yeah, exactly, so nope, I’d rather not. Sam: As we get closer to that cyborg thing, we’re going to be more attached to it, because it’s me. Christian: Yeah, it’s a part of us. Sam: Maybe that’s where I’m going with my wallet. It feels like it’s mine, it’s part of my identity, hopefully, anyway. Other people might not recognize it. Christian: It certainly does, yeah. I hope that we are going into a future where we don’t replace the synergy all the time, and maybe also it’s the same discussion we have about peak oil, that in 20 years from now we don’t have enough oil anymore for the entire world. The problem is we have been saying this for 50 years from now, so maybe the same thing happens at some point to some of the materials we are using in technology, that we will run out of them. It doesn’t really look like that, but maybe at some point we will be forced for reasons of availability of resources to change our entire production cycles of those things. Sam: If you could either go back in time or change it for the people that are doing now, what would you change in your undergrad education? Would it have been beneficial and would it be beneficial for the wider crowd to have more sociological work, earth systems? Is it worth trying to get that into computer science? Christian: I think so. I have to be honest, when I started my undergrad, I had to pick a minor. It was called “application subject,” or something like that, and one of them was psychology. I was like, “What? What’s the connection between computer science and psychology?” I totally didn’t see that, and obviously once I took HCI courses I was like, “Yes, I see the connection. I want to change,” and I couldn’t change anymore because the European system changed to Bologna and there was lots of political reasons involved, so I stuck with physics, which is obviously very different to psychology, but now I see this, I personally would have liked this. I personally would say, yes, it would be great if we would give everyone at least the opportunity to more realize how much this all back-feeds into the society. What we do in terms of technological advancement, it also might change society for the better. I don’t know. The thing is that I don’t really know if many people see it that way, especially in undergrad when you start, like me, very naïve. You start and you want to program stuff. You study computer science for a reason. Not everybody is really interested in this. Not everyone really wants to do this. I think it would be great to have more sociology and those kind of things in the curriculum, but how, that’s a challenge, how to get people hooked on that. Sam: Do you think there’s a killer app out there for sustainability? Christian: Maybe, but if so I don’t see it. If I saw it, I would be developing it. I would go home and start developing it, but I don’t really see it, unfortunately. Sam: We’re writing a book of these interviews. We’re calling it Tomorrow’s Heroes, as if we were looking back at people who are doing good, and let’s described those as heroes. Even if people don’t want to be described as heroes, we’re doing it anyway. How would you see your sustainable superpower? What’s the special thing that you’re bringing to us? Christian: Ooh, wow, that’s a lot of responsibility put on one. Obviously, as I’m writing my PhD thesis, it all comes down to the question like summarize the thesis in one sentence. Like I said, I think the research is already there, but just trying to connect the research that’s out there to practitioners that then apply this in everyday life, and in product design, hopefully, at some point, that would probably be what I would say. Obviously, like you said, I wouldn’t like it to be called like heroes or a superpower. Then you talk to other people and at some point they’re like, “Oh, that’s really interesting,” and they show some sincere interest in this kind of work. I think identifying those kind of spots, and obviously that culminates in a PhD, so, yeah, I would agree. Christian: I would love to say yes, but I have to say no. Sam: Okay, there’s 2 questions in there. Why would you love to say yes, and why do you have to say no? Christian: Because I feel like we need more activists, we need more action. Like I said before, just sitting back and waiting for things to happen, to turn out to be better, isn’t really what we should do, but it’s just more convenient to do exactly that, so I could do so much more besides my research, obviously. Christian: That depends if it’s a work day or a weekend. I think one of the great things about doing a PhD is that you’re doing work that you really enjoy. I think that that is always something that I’ll look forward to. Yeah, that’s actually one of the things that kept me from writing in the past few months. I have so many other things that are so much more interesting. Obviously, everything else is much more interesting than writing up this piece of research. Sam: Including doing the dishes? Christian: Yeah, yeah, everything, cleaning your house top to bottom. Sam: What’s the biggest challenge you’re looking forward to in the next couple of years? Christian: In my personal life or in general? Christian: Figuring out what to do next, honestly, that’s kind of the thing, because I have no idea where it’s going to be in one year from now. Sam: If you could wave a magic wand and have a miracle occur by the time we wake up tomorrow morning, on San Jose time, what would that be? Christian: Just one? We talked about so many problems here and we had this great workshop over the past 2 days, where we had about 100 problems that we put on the wall. Solving some of them would be awesome. I’m not going to go for the very cliché like world peace, but something like … Obviously, I have a vested interest in my PhD research, so solving some of those issues with the magic wand would be amazing, yeah. Christian: Act responsibility, think responsibility, yeah, maybe just be aware of what your actions are and what they imply. Like I said, activism is a big thing here, but that takes a lot of commitment. This conversation was recorded at CHI2016.